-- Select a Size/Color -- 6-10" - Out of Stock! 10-16" 14-20" 18-26" - Out of Stock! 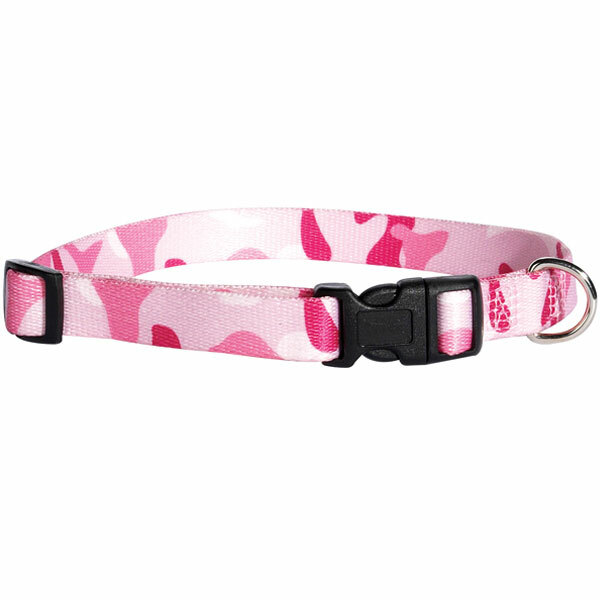 We love the combination of the different shades of pink on this rugged camo collar! The Guardian Gear Camo Dog Collar in Pink is made of durable, woven nylon and includes a quick-release plastic buckle. It's heavy-duty hardware and thick nylon make this collar dependable and fashionable. Look for the matching pink camo dog leash, sold separately. Guardian Gear Camo Dog Collar - Pink Customer Photos - Send us your photo! Maiya is stunning in her pink camo collar and she knows it! Posted On 08/31/15 by Cheri C from Jessieville, AR Yes, Cheri C recommends this product! Bought this for my new Livestock Guardian Dog Ayla. Looks ADORABLE on her and holding up well outside! Posted On 08/27/15 by Ryan G from Atlanta, GA Yes, Ryan G recommends this product! Good and easily adjustable fit, snap buckle connects securely. Posted On 05/01/15 by Connie O from Schwenksville, PA Yes, Connie O recommends this product! This pink camo collar is well made - true to size and easily adjustable. Has a nice size ring to attach a leash - all very sturdy. Looks great on my black Havaton! Posted On 03/12/15 by Julie M from Yukon, OK Yes, Julie M recommends this product! Looks great on puppy! Even sturdy enough! Always get your collars from Baxterboo, they last!!!! Posted On 11/21/14 by Lisa from , Yes, Lisa recommends this product! Very "Girly" for my Daddys girl! Posted On 11/08/14 by Alice V from Union, WA Yes, Alice V recommends this product! Nice collar - very stylish and pink so they know our pup is a female! I was happy to come across this website. They had a big selection and a cute assortment.